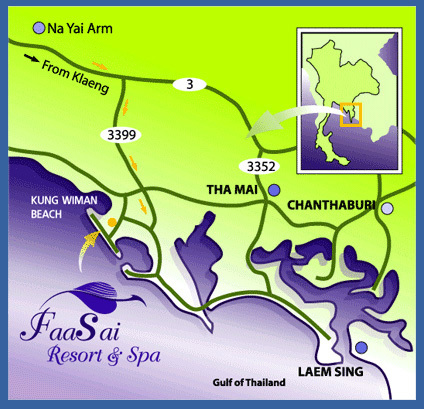 Faasai Resort and Spa is a peaceful coastal haven only 220 kilometres to the southeast of Bangkok or about three hours by car. The quiet garden resort is only ten minutes walk from Kung Wiman beach and a good base for exploring the beaches and mountains of Chanthaburi. The nearest airport is Suvanabhumi, Bangkoks international airport, about two and a half hours away, which has buses going directly to Chanthaburi. It is a good alternative to the other eastern beaches of Ko Chang or Pattaya, as it is closer than Ko Chang and quieter than Pattaya.We can arrange transport to and from the resort by taxi or private van. Alternatively there are regular bus services with buses leaving almost every hour from Bangkok. If you are driving from Bangkok, take the eastern motorway to Bang Na, then Ban Bueng before turning into highway 344 to Klaeng and Chanthaburi. At Klaeng turn left into highway 3 and then 32 kilometres past Klaeng turn right into highway 3399 which will take you to Kung Wiman beach. You will see Faasai on the right 300 metres before you reach the sea. If you ask information at the airport they will direct you to the buses. The airport extension for more information is 9907. You can take the commuter train from the airport to the city. It takes about 30 minutes to travel the 28 kilometers (17 miles) and it links with both the Subway (MRT) and Skytrain (BTS) systems in Bangkok. You can take the BTS to Ekkamai where it stops right by the eastern bus terminal. Altitude 31 meters (+/-6) above sea level.